Take advantage of EOP's Seasonal Diversity Recruitment Packages-Customize your Diversity Print campaign and reach women, members of minority groups, and/or people with disabilities with one discounted package price. Buy any three full-page, or 1/2 page ads in the same season, get 20% off each magazine. 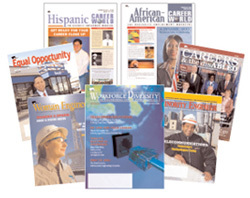 Take advantage of our yearly package buys and save up to 45% off print advertising, discounted color charges, and over $30,000 worth of free value-added services including a free 12-month banner ad on EOP's website, 12 months of free access to EOP's online resume database, a certificate of recognition for your diversity efforts, and a free profile page opposite each ad (available for print advertisers only).